Home FitnessRunning Successful Pacer & Pacing – What Makes It? It’s a real honor and privilege to be a Pacer! To see a runner realize her dream – to see her get to the finish line in a time they set out their journey for! 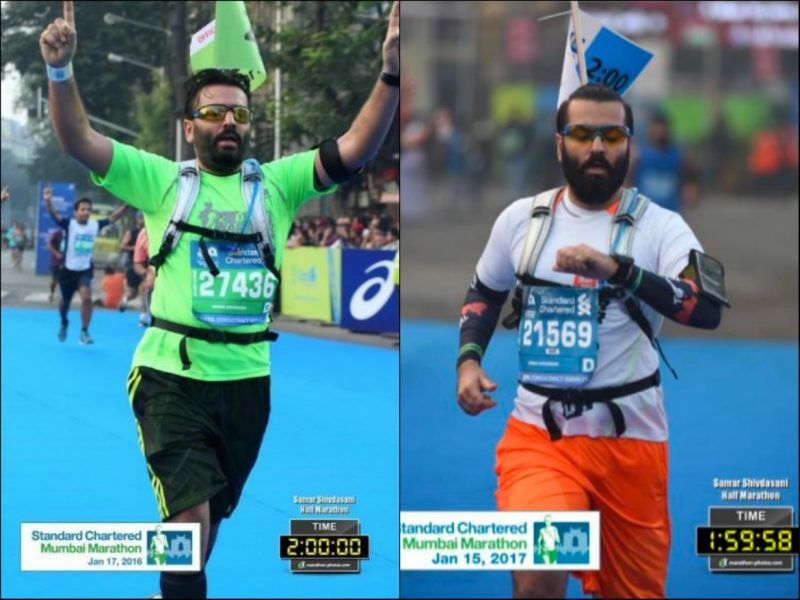 While I am by no means a professional or veteran pacer, I have successfully paced the 2 hr bus 3 years in a row at one of India’s most prestigious marathons, the Standard Chartered Mumbai Marathon. I say successfully as I have been fortunate enough to not have a ‘bad day’ and come in at 1:58:35 in my first attempt, 2:00:00 in my second attempt and 1:59:58 in my third attempt. The purpose of this ‘gyan session’ is to share those learnings and provide my personal perspective on how pacing should be viewed from a pacer, organizer and runner perspective to ensure all stakeholders get what they desire from it. Match your running style with that of the pacer – because this will maximize your probability of staying on that bus. For example, if you typically run a positive split then joining a pacer whose plan is to run a negative split would be problematic as they would start to speed up when you would typically slow down, causing you to ‘fall off’ the bus. Always Set Realistic Targets : You want a ‘Personal Best’. You rely on the pacer to take care of the pacing so they can focus on just running. I have people joining the 2 hr bus when their previous best is 2:15 or 2:10 and they haven’t really been training at the 2 hr pace either. This will cause you to go out much faster than what you are used to and you end up ‘blowing’ your run and run out of gas in the death kilometers. Not a pleasant experience! The Pacer : The primary objective is to bring the bus home on time but the difference here is that it needs to be done as per your stated plan. Have a tried and tested stated plan: It doesn’t work if the 2 hr pacer reaches the 20 km mark in 1:50 and then walks the last km in order to finish ‘on time’. Remember : The runners (aka passengers) who have hopped on your bus are anyways pushing themselves outside their comfort zone just to finish in 2 hrs and if you push them harder than is required they will most likely start dropping off like flies by the 14 or 15 km mark. As a pacer, can you motivate the passengers in your bus? which can be done in many ways. No easy task and I usually lose my voice after every race that I pace. Distract your passengers by talking about anything but the race at hand, clapping for and supporting elites and other runners along the way or shouting slogans and ‘hurrahs’ just to keep that adrenaline pumping. It’s amazing how yelling to motivate others can have a corollary effect of motivating yourself! Pacer’s responsibility of hydration – Ensure that everyone is drinking enough water/electrolytes at regular intervals to prevent dehydration or cramping. Even gels and energy bars/beans require a strategy and plan as to when they should be taken to maximize their impact. The Organizers : the objective really is to empower your pacers so that they can go out there and achieve their objectives. First and foremost is the kit, providing the right pacing kit can have a dramatic impact on your pacer’s performance. As seen above, the pacer already has a number of things he/she is focusing on and holding their flag or vest together is certainly not one of them. Proper labeling of the kit with the bus timing and name of pacer is important so people can quickly and easily locate them in a sea of runners. Effective and timely communication of your pacers is another critical aspect as pacers usually spend 2-3 weeks before the event engaging with interested runners either on facebook or whatsapp clarifying their strategy and guiding runners on the do’s and don’ts of racing. Recently, there was so much spatting faced by the pacers at India’s largest Running Event – It made me stop and think about what really is going wrong? Is pacing all about a pacer? Does it have nothing to do with the runner and most importantly the organiser of the event? Pacing does not follow this ‘one size fits all’ rule of thumb. This is the most controversial aspect of pacing as there really isn’t an international standard that one can point to. Hence, each organizer sets their own expectations, ‘Not a minute early…….not a second late’ is the most commonly heard rule of thumb. Why are we not factoring for race distance? Does it not make sense to adjust your expectation whether you are pacing a 5k, 21k or 42k? If not, it’s like asking an archer to hit the same bulls-eye standing at 5m, 21m or 42m from the target! If you want to even the odds of the archer then you need to increase the size of the bulls-eye as you move further way (I am yet to meet an organizer who wants their pacers to fail). So, translating this to pacing jargon, one needs to adjust the expected completion time (aka margin) the longer the distance. As a pacer our primary objective is to always finish the race as per plan, but as every runner knows things usually never turn out the way you envision it and allowing for that, within certain tolerance levels, is essential to the success of a pacer. It’s when the Organiser + Pacer + Runner equation will come together, Pacing will be holistically successful! Samar has been running for many years. For the last 3 years, he has been giving his worth as a runner to the community by picking up the act of Pacing. A successful pacer, he takes pride in having taken many people to their personal bests. With many controversies around, the above piece are his thoughts on why successful pacing is a combined effort of everyone involved. That’s a great insight in what and how pacers do their thing. About the target timing…yes the rule of ‘not a minute earlier and not a second late’ is like the bullseye. But does even the best archer / shooter hit it every single time? No..there are too many human variations. and 21k / 42K is a long distance. But some folks have chosen to take this single aspect and write long posts on performance evaluation of pacers. To my mind this is very contrary to the spirit of the sport which is about being social and helping each other,,,which is what pacers get out to do.